Fire pits have become popular features for upscale patios as outdoor hearths to take the chill off a cool night or just to encourage guests to gather ‘round. Elizabeth Przygoda, an artist and landscape designer who owns the Arizona home products company Boxhill, was frustrated by the fire pit choices at lower price points – so she designed her own. The result is the elegantly modern Vesta fire pit, priced at $395. It’s named for Vesta, goddess of hearth, home and family and does somehow invoke the shape of circular pagan temples – it could serve in one’s imagination as a vessel for the sacred fire. Available in a classic rust (shown) or raw steel finish, it features a 32-inch by 23-inch bowl atop a 9-inch tall base 19 ½ inches in diameter. Available at shopboxhill.com, it would make a handsome gift or a special little outdoor accessory for the season ahead. Chanting and vestal virgins optional. If you’re going to tangle with roses, you’re going to get hurt – unless you invest in some effective protection. Ordinary garden gloves that end at the wrist aren’t really enough to offer a barrier to vicious thorns. Gauntlet-style rose gloves cover the forearms and keep blood off the mulch. This pair from Jackson & Perkins, a long-time marketer of roses, is made of synthetic leather with padded palms and reinforced fingertips. The best part? When they get dirty they can be machine washed on a gentle cycle and hung to dry. The gloves come in medium (sizes 6 ½ to 8) and large (size 8 ½ and over). Buy them for $35 at jacksonandperkins.com. Pruning shears, loppers, hedge cutters and pocket knives all play an essential role in the gardener’s toolbox. Once blades become dull, though, their usefulness is limited. The idea is to cut stems cleanly, rather than leaving crushed and ragged ends that invite disease and look unsightly. Learn to sharpen your cutting tools and you’ll extend their useful lives. One handy gadget is DMT’s double-sided Diafold diamond file. Designed with see-through resin handles that fold to protect the sharpening surface, these files can be carried in a pocket for quickly restoring sharp edges to dull tools. If you need some “how to” pointers, see the “Pruner Sharpening” video on the “Gardening, Landscaping and Floral” page at dmtsharp.com. The files pictured, with coarse and fine surfaces in various grades, are $30 at amazon.com; more models are available at dmtonlinestore.com. Practice one-upsmanship over those who think their redwood “estate boxes" or terra cotta pots are the last word in container gardening. 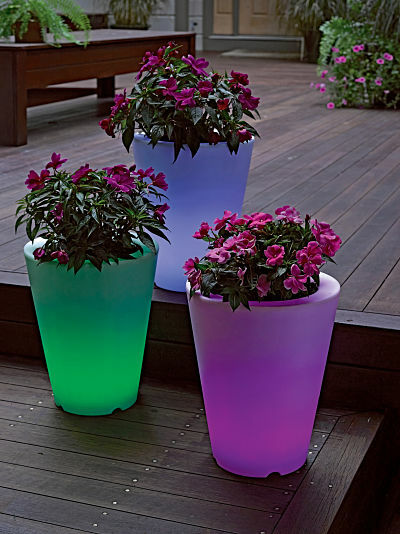 The pot’s solar panel is mounted on a 10-foot cord for easy positioning and the planter glows for six to eight hours on a full charge. Round planters shown are 15 inches tall, 12 inches in diameter and cost $89.95, $79.95 for two or more. Betcha can’t have just one. Many of us come to hate the chore of watering because conventional hoses, once filled with water, are so heavy to drag around. Can you say back-breaking drudgery? Water Right’s new super-light polyurethane hoses weigh less than half as much as the standard kind, making the job much easier. Fitted with solid brass fittings and industrial-strength spring guards to prevent hose-end kinking, the colorful hoses are designed to remain flexible at all temperatures. They are drinking water safe, too, if you’re the kind who treats hoses as impromptu water fountains. These are ½ inch in diameter and come in 25, 50 and 100-foot lengths. Priced at $40 to $100, they are available from Gardener’s Supply Co., gardeners.com or 888-833-1412. Light up your next garden party with these beautiful solar-powered lamps, inspired by traditional Japanese lanterns. The deeply creased “waves” and printed surfaces give the modern Soji lantern a sophisticated new look. Contemporary design meets sustainable solar technology in a fixture equipped with two LED lights, a built-in solar panel, rechargeable batteries and stainless steel hardware. The nine-inch lantern turns itself on at dusk and casts a golden glow through the evening, all without any need to string unsightly electrical wires. Hang them from the trees, the eaves or plant hooks. With six to seven hours of charging in full sunlight, the fixture will shine a soft light on all your outdoor activities for about five hours. Available for about $35 from greenlivingeveryday.com. Smart cooks like to have fresh herbs on hand and you can, too, with Garden-in-a-Can, the easiest way to have organic seasonings at your fingertips. What’s inside? Nutrient-rich soil, organic fertilizer and biochar (activated charcoal) for drainage, plus seeds of basil, cilantro, sage or dill. Crank the can open, add water and before long you’ll be harvesting the perfect seasoning for tomatoes or guacamole. If soil tends to stay soggy, punch a hole or two in the bottom of the recyclable can. Made by backtotheroots.com, Garden-in-a-Can is available through the website in four-packs, one each of four herbs, for $23.96. Here’s a handy, multi-purpose cart that will do the heavy lifting in the home and around garden. The WORX AeroCart is a wheelbarrow that converts to a two-wheeled dolly and has sturdy bars and straps that will move heavy containers or balled-and-burlapped plant stock. Need to shuffle propane tanks? Cylinders won’t roll off its platform. Boat trailer in the way? With an optional hitch, this will do the job. Weighing in at 41 pounds, the cart is designed to make a 300 pound load feel like 25. Tires are of the flat-free design and there’s even a seat if you need one. The cart stores compactly in a space only 15 inches in depth, ideal for small sheds or crowded garages. The AeroCart is $160 at worx.com, amazon.com and most Home Depot stores. What gardener hasn’t secretly wished for a compact little greenhouse to extend the growing season? Just think – you could get your tomato plants underway early, your seeds germinating while the snow flies and harvest some fast-growing salad-makings like leaf lettuce and radishes before the outdoor planting season officially begins. Even without added heat, a greenhouse kicks gardening up a notch and offers the ultimate protection for plants vulnerable to cold, insects and four-legged critters. If you’ve ever wondered whether this is within your budget, here’s the answer. A small greenhouse sold as an assemble-it-yourself kit will set you back about $1,500, exclusive of site preparation. The Orion Greenhouse shown is available in two sizes – 6 feet by 6 feet, selling for $1,260 and 6 feet by 8 feet, available for $1,420. Both sizes offer two glazing options: insulated TwinWall glazing or tempered safety glass with acrylic curved eaves. Both are 7 feet, 8 inches tall at the peak, allowing room for bigger plants. Orion Greenhouse kits are designed in the United Kingdom by Vitavia, known worldwide for quality construction. These greenhouses are sold in the US by Charley’s Greenhouse & Garden, www.CharleysGreenhouse.com or 800-322-4707. For those looking to garden smarter not harder, self-watering containers are a boon. The GrowBox is among the latest of these shortcuts to gardening success and a lazy gardener’s planter of choice. Each GrowBox is 28 inches long, 14 inches wide and 12 inches tall. It holds 42 liters of soil and has a built-in reservoir for four gallons of water, which is released to plants as needed. The new twist here is a Nutrient Patch, a fibrous cover that fits over soil and gradually releases fertilizer every time plants are watered. Sold in terra cotta or dark green plastic, the GrowBox is $30 from AGardenPatch.com or 800-519-1955. Designer colors are available for $38 each. These containers are great for annuals and salad crops but if you want to grow tomatoes or a flowering vine, there’s a companion support cage available for $26. With no weeding, no fertilizing and minimal watering required, the GrowBox is ideal for city balconies and patios, but a few of them could also replace the standard vegetable patch in roomier locations. Waterproof rain and garden shoes from Sloggers are perfect for working in the garden or running errands on a wet day. Clean-up is easy—just hose them off. The new Chicken Collection features the whimsical artwork of artist Sarah Rosedahl. Deep treads give these shoes excellent traction in water and mud. When they wear out, you can send them back to Sloggers and the company will recycle them. Also available in Daffodil Yellow and Barn Red, the footwear comes in women’s full sizes from 6 to 10. $34.99 for shoes and $39.99 for boots at garden stores and online at sloggers.com. When it’s time to harvest vegetables from the garden, there’s nothing quite as handy as a stylish garden trug. The Joseph Bentley trug is about 16 inches long and 12 wide, big enough to carry a full day’s harvest. Made of metasequoia wood, it features sturdy handles and wooden feet that stabilize it on hard surfaces. Much more traditional than gathering produce in a plastic bag or colander, a trug adds a touch of class to a mundane garden chore. $24.95 from josephbentleyus.com or amazon.com. Think of the WheelEasy as Wheelbarrow 2.0. Equipped with a sturdy fabric “bucket,” this handy cart holds up to 150 pounds and when not in use, can fold up and get tucked into a closet or hung on a wall. Perhaps its best feature is that it can be laid flat on the ground – ideal for sliding in plants with heavy root balls, raking in leaf debris or mulch or shoving in hefty rocks. Thanks to the cart’s low center of gravity, the user bears a fraction of the weight of any load. Made by Allsop Home & Garden, it’s about $95 at allsopgarden.com or amazon.com. *Disclaimer: I got one of these as a free sample about 12 years ago. I liked it so much I have since bought a replacement and will buy a third when needed as I consider it an essential tool. Encourage pollinators and bug-eaters with this trio of handsome homes for backyard wildlife. New this spring from Gardener’s Supply Company, the houses are made of bamboo and suited for (from left) mason bees, butterflies and small birds like wrens, nuthatches and titmice. The former two pollinate flowers and crops, boosting harvests. Mason bees are increasingly important, given the decline in honeybee populations, and visit as many as 1,000 flowers a day. Birds, especially while nesting and raising young, are constantly on patrol for insect pests that might otherwise help themselves to your plants. Each house is 10 inches tall and 6 inches wide; the bird house has a clean-out door on the back to make discarding last season’s debris a breeze. They are $20 each, $50 for all three from gardeners.com. The Vermont-based company is employee-owned, specializes in earth-friendly produces and donates 8% of profits to gardening and other community projects. Once you start collecting plants – especially if you favor a particular species – it’s easy to forget which is which. This is where plant markers come in handy. There are many types, improvised and purchased, that will do the job. Wooden markers tend to rot, plastic ones suffer from ultraviolet (UV) deterioration and metal markers are often pricey. BioMarkers, made from a patented material blending recycled plastic with corn cobs, are a new choice. Tough enough to last several seasons, the markers come with weatherproof labels that can be hand-printed with plant information or prepped with an inkjet printer. The labels peel off easily if the marker needs to be repurposed. BioMarkers come in four colors and three sizes – 9, 12 and 24 inches tall. Prices start at $19 for 15 nine-inch markers. Order them at mcgBioMarkers.com or call 800-305-9983.